I’ve set up Aurora Rose’s room on top of a dresser in my dining room, and that makes it easier to start seeing how things look all together. I’ve finished up a few items of clothing for her, finally–enough to start filling her hangers, and get her some lounging wear and underwear. Now for some outfits! I think she’s going to need a laundry basket soon, and that would make a good quick and easy project for the site, so I’ll do that soon. The labels are transfers made with liquid polymer clay. I glued things right onto the tray, so that they don’t fall down every time someone walks past. 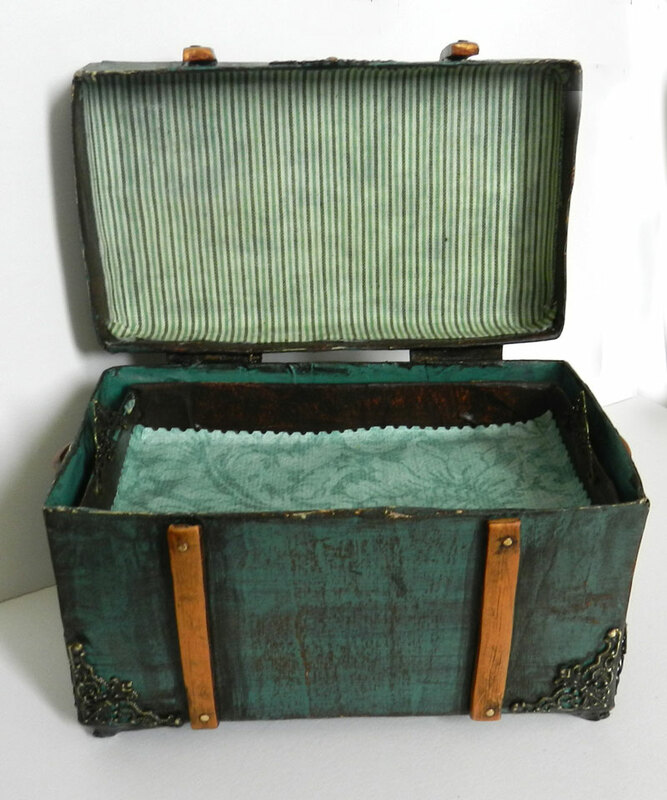 I think they will eventually go in her trunk, but for now her shelves need somethings on them, and I have not had time to finish her books or even think about starting a tea set. 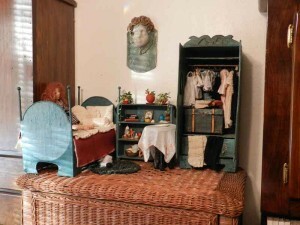 There’s been a lot going on, but I’ll be sure to find more time for Aurora Rose and her room. I’ve got big plans for her little things! I’m finally getting around to making some clothes for Aurora Rose. 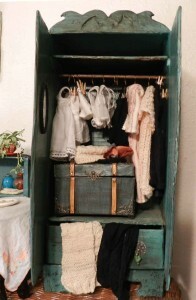 I need to get something on those clothes hangers in her armoire! During the holidays I carved out some playtime for me, and I’m sewing a few outfits for her this week, and now she has a warm winter nightgown as well as summer jammies. 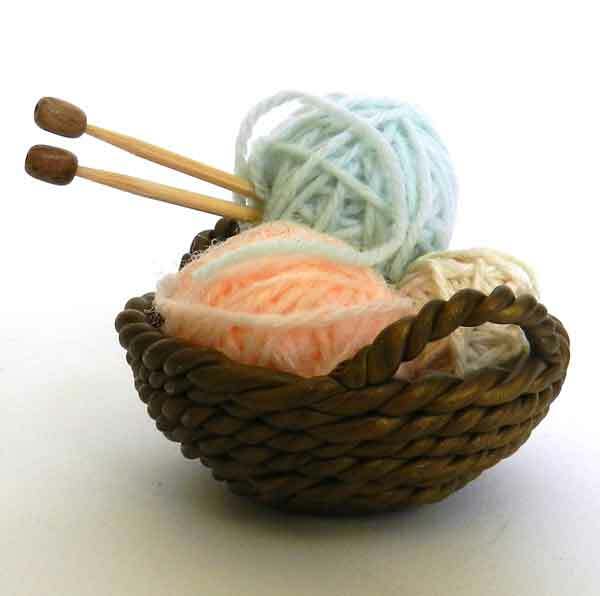 Plus, she now has a knitting basket, so she can whip up a sweater while I’m busy elsewhere and not looking…. 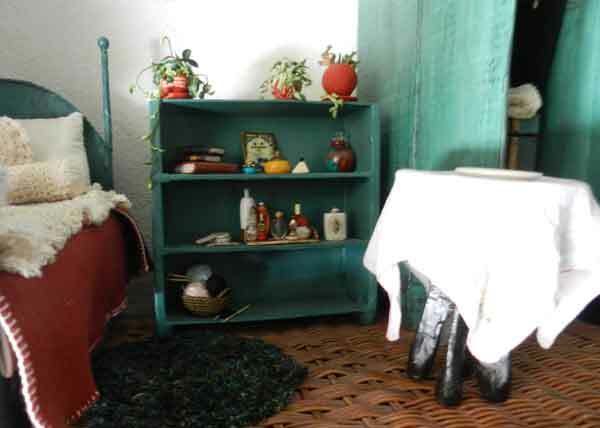 I’ve been working on a set of furniture for Aurora Rose for several years, but large scale life keeps intruding. 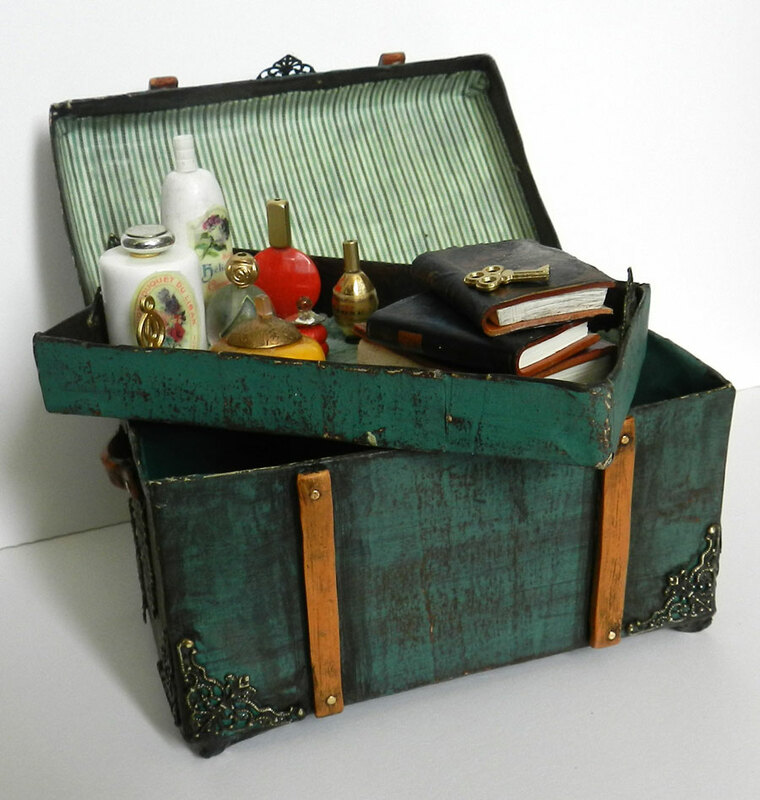 In my effort to finish up projects that have been hanging around the workbench, I’ve finished her trunk and some toiletries. She has a bed, an armoire, and her table just needs a final sanding and some paint. 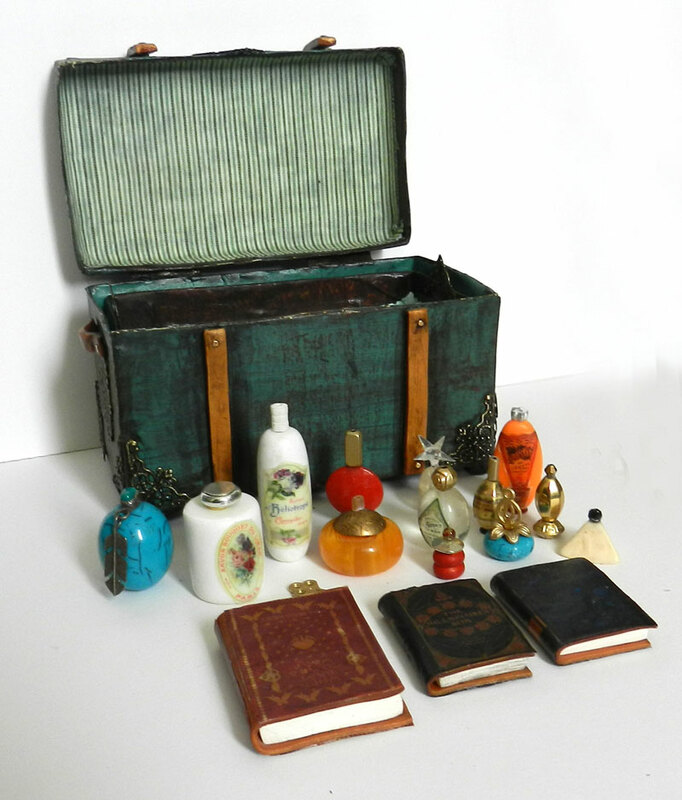 I’ve even gotten some clothes cut out and started for her, and am half way done with some potted plants, and of course, several more books.They are done with liquid polymer clay transfers over white and gold polymer. I’m aiming at being able to set it all up and see it together for the first time by the end of the year. Let’s see if I make my goal! 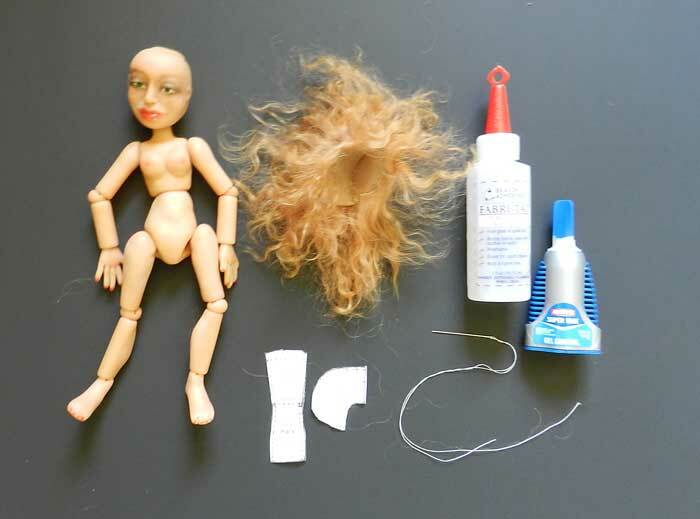 I finished up the how- to video for the Polymer Clay Adventure, and had some spare pieces–a head and torso. 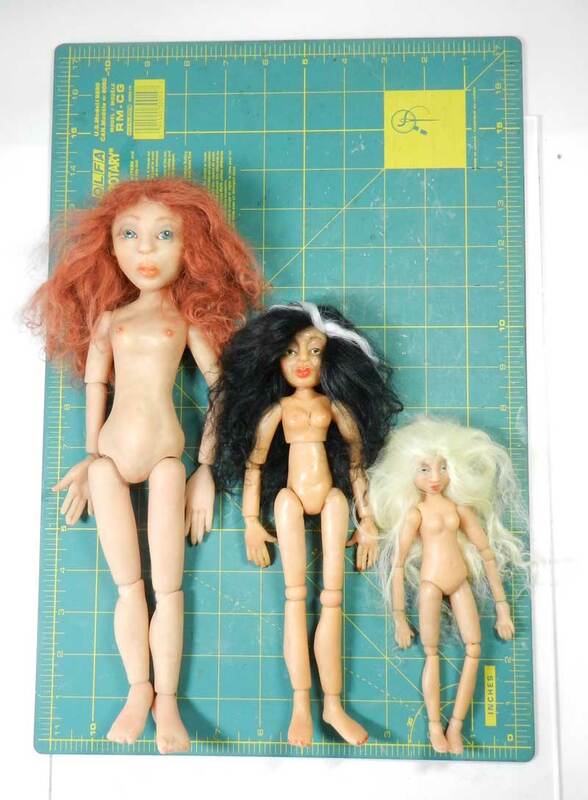 So, I made the rest of the pieces, found a few GREAT shortcuts/improvements along the way that I’ll be talking about in chat with the students who take this class, and put together another 9 inch doll. Her name is Angelique, so says my sister. I also made a teeny little version who is about 3 inches tall. She’s destined to be a baby doll in Aurora Rose’s doll collection–yes, my doll needs a doll collection. 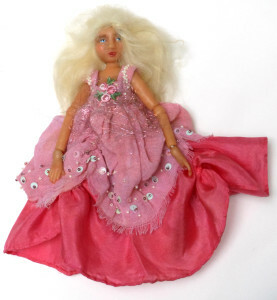 At least a few….a bjd, a rag doll, some polymer tinies, some paper dolls, and a teddy bear, I think. It’ll all come together eventually, but for now, I’m glad to be finished with the video. 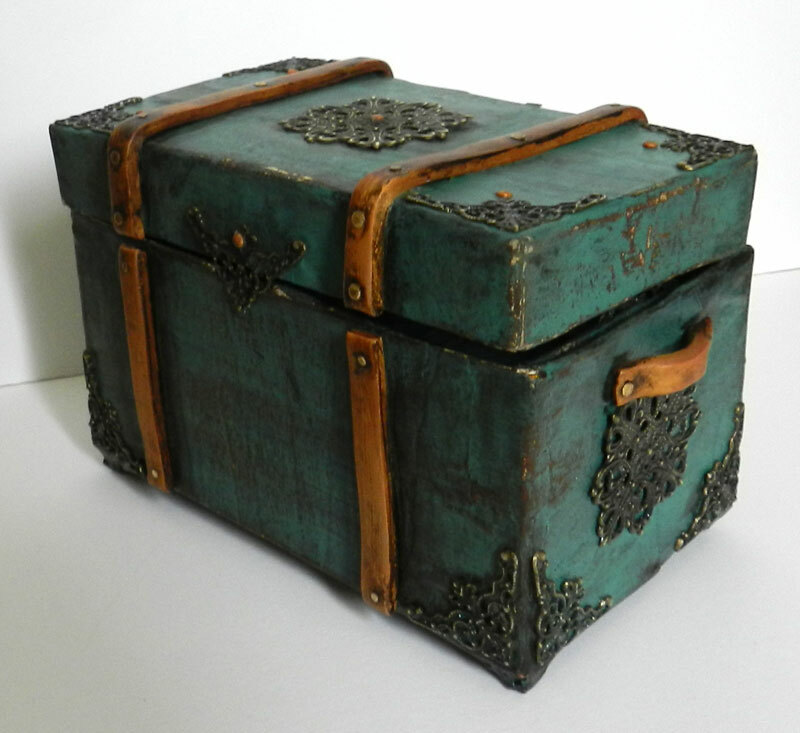 It will be made available mid September, and if you would like to join us, please do click here to visit Polymer Clay Adventure. 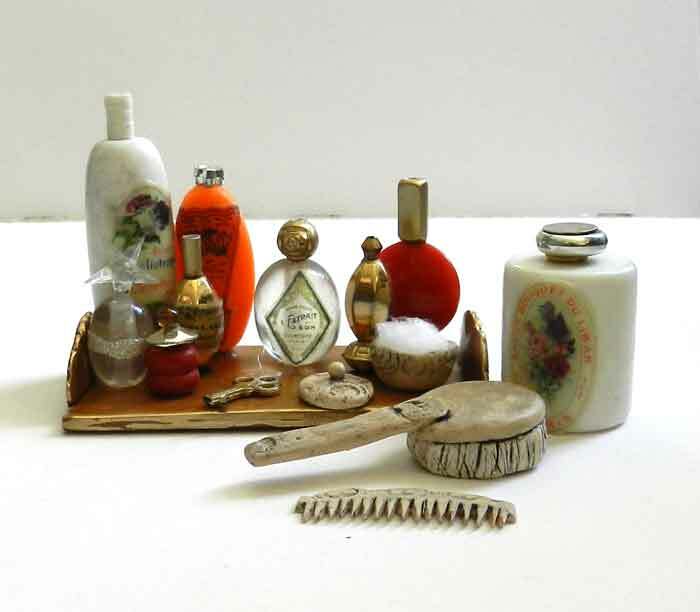 I’ve also put together an Amazon a-store that has tools, books, and supplies like varathane, elastic, fabritac glue and more gathered together for those needing a source of supplies. I still prefer to get my Kato Polyclay, both solid and liquid, from Donna Kato’s Prairie Craft company. I’m enjoying making ball joint dolls with polymer clay! 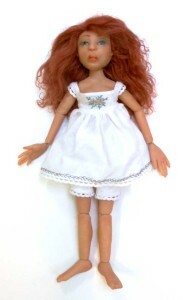 So far, the dolls have been around 6 inches, 9 inches and 13 inches tall. I’ve got plans to make them smaller and bigger, too. I find that it really helps me to play with design ideas and keep things in proportion by making a quick pencil sketch. I can use the sketch to check the size of parts as I make them and not get too far off. 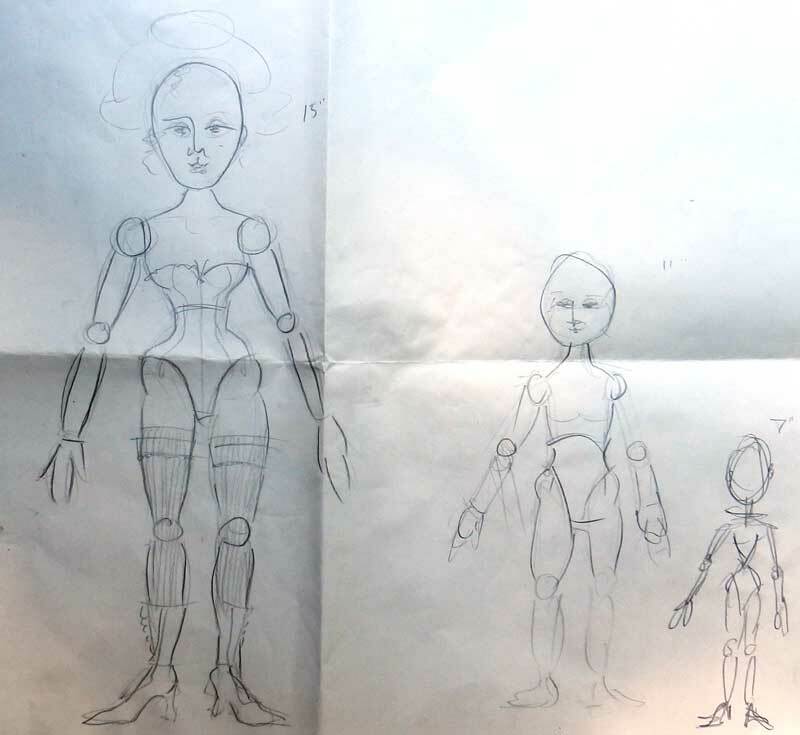 At left is the sketch I used in making the 9 inch doll Roberta Lee for the how-to video and the 6 inch doll Lulabelle for the 25 page full color .pdf written tutorial. These are available exclusively as part of the Polymer Clay Adventure. 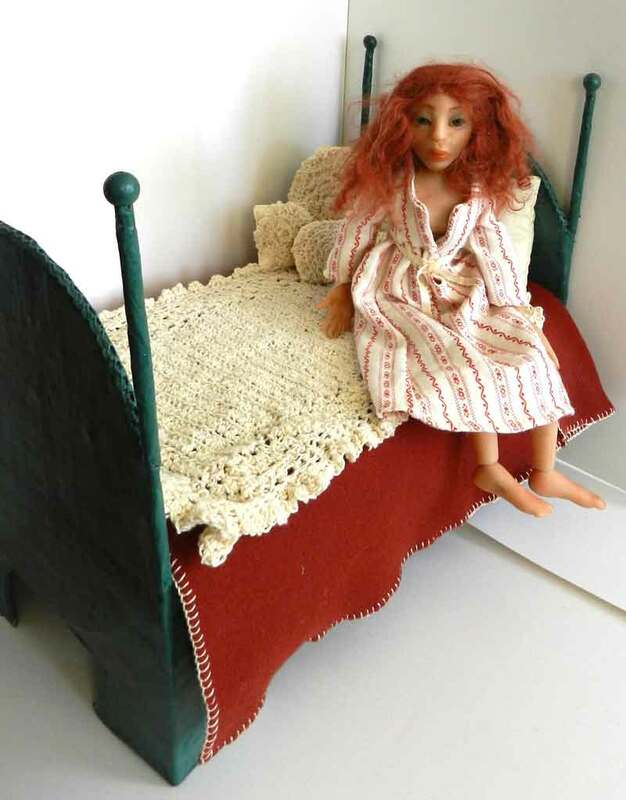 Join me and try your hand at making ball joint dolls, as well as the projects by the other 21 instructors involved in the online retreat. 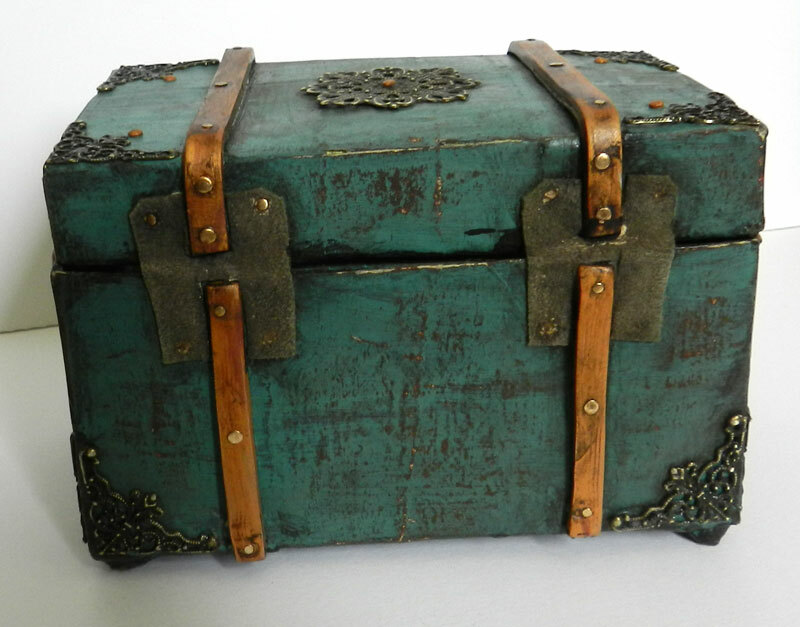 Click here to visit Polymer Clay Adventure. 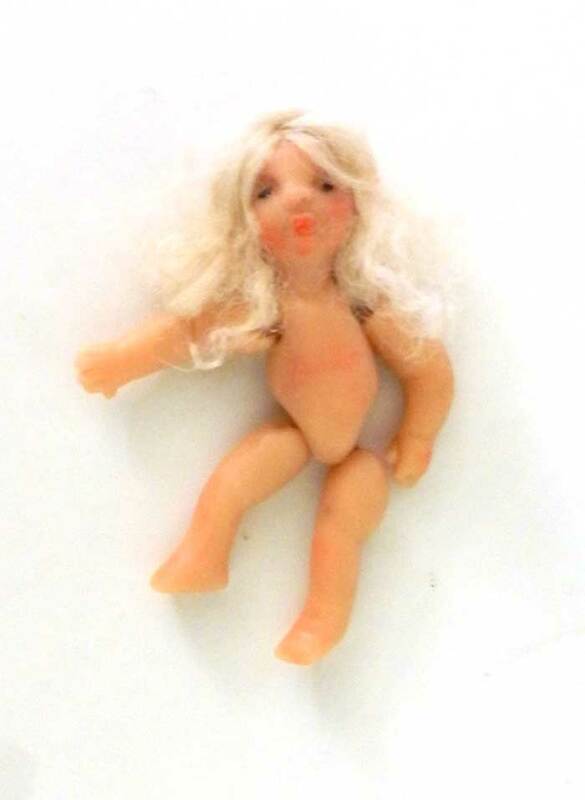 I made an extra head and torso during the 9 inch doll video, so this week I am finishing her up and getting ready to finish up a purple faerie doll that will be around 15 inches tall. 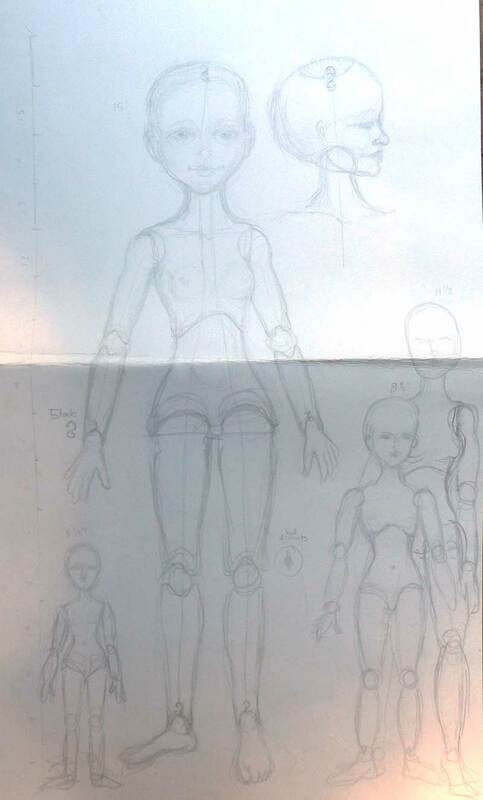 Then I get to start some new dolls! I’m also stretching as to sizes…I’ve started a 3 inch baby that has jointed arms and legs to be a baby doll for Aurora Rose. 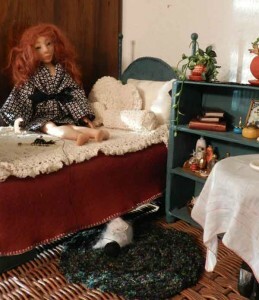 I decided she needs a doll collection of her own. 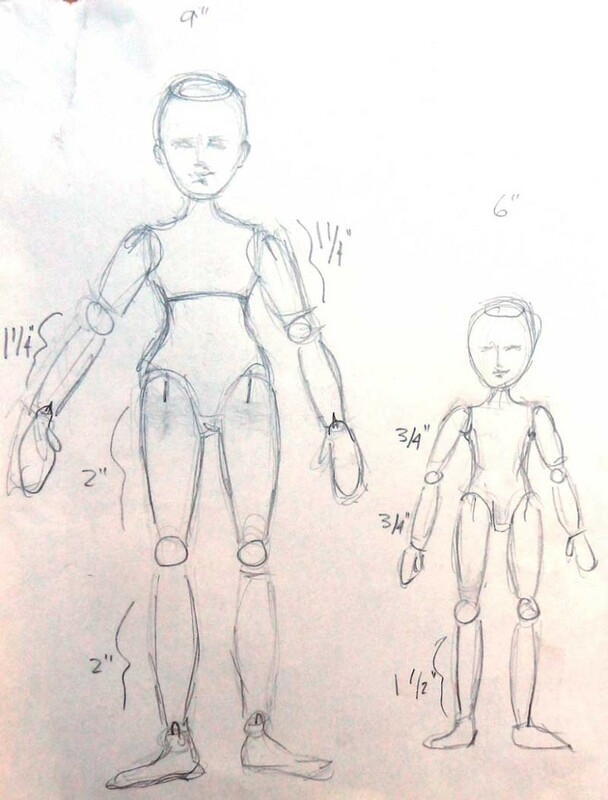 Then, I have sketched a 12 inch Japanese girl doll using my Noh Maiden face mold that I sculpted, and a 15 inch Victorian Miss. 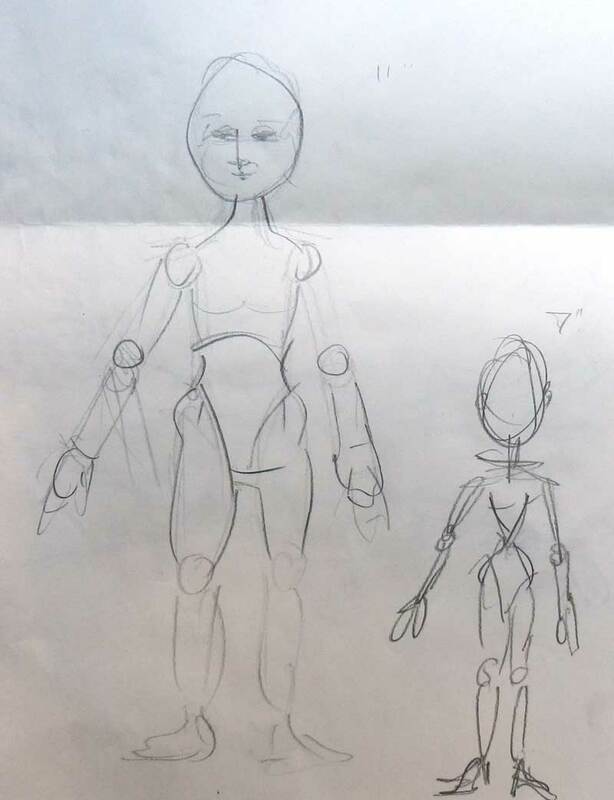 I’ve got sketches for a 20 inch doll that will be the biggest completely polymer doll I’ve made so far, although I’ve made several life sized cloth dolls. I’ve got plans for faerie dolls in several sizes, a mermaid and too many ideas to track without committing a few to the paper stage. It may take a good bit of time, but I will be making dolls for a while to come still, and enjoying bringing my sewing, beading, and knitting skills to bear on their wardrobes. I learn something new and make refinements to the process with every doll, and that changes the plans for the ones that come after. Check back in and see what happens next in my little world. The month of May has been a very busy one! 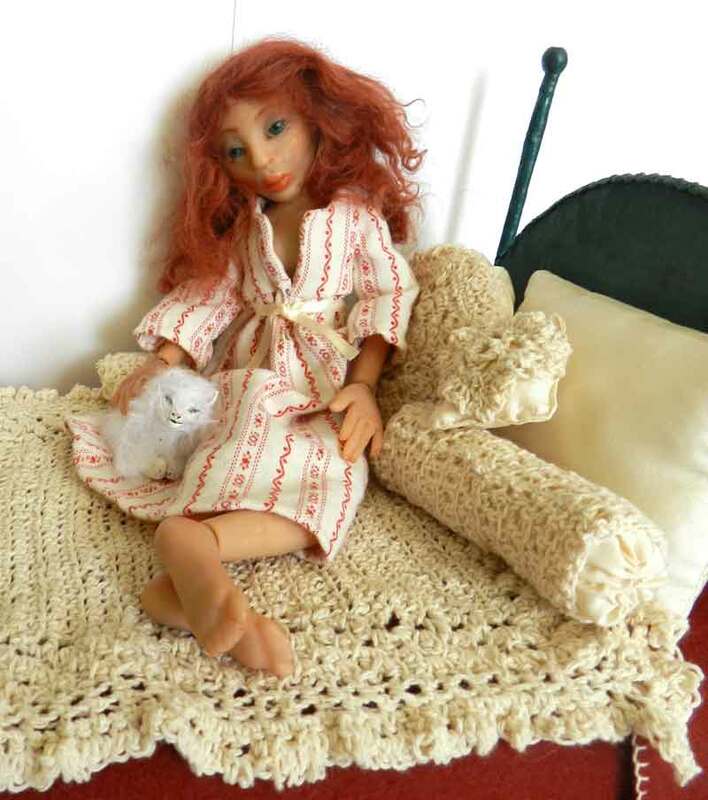 In addition to building websites for clients and starting to fill in some pages here on this site, I’m finishing up the 11 part video and 25 pg .pdf tutorials on how I make ball joint dolls like Lulabelle, Roberta Lee and Aurora Rose. These are available exclusively through the Polymer Clay Adventure.I’ve got videos to shoot for more dolls, and doll accessories, including mermaids, faeries, and a some women of the Wild West (she’s a larger doll like Aurora Rose and up next).I just HAPPEN to have a complete wardrobe of patterns for her that I drafted for cloth dolls way back when, that will be very easy to adapt. Pattern drafting for dolls is the subject of a future tutorial as well. I am very grateful for the hours my mother and grandmother spent teaching me to sew, crochet and embroder, and for the years in college learning costume design and construction, wig making and millinery arts, makeup and more. So far the dolls have been between 6 and 13 inches. 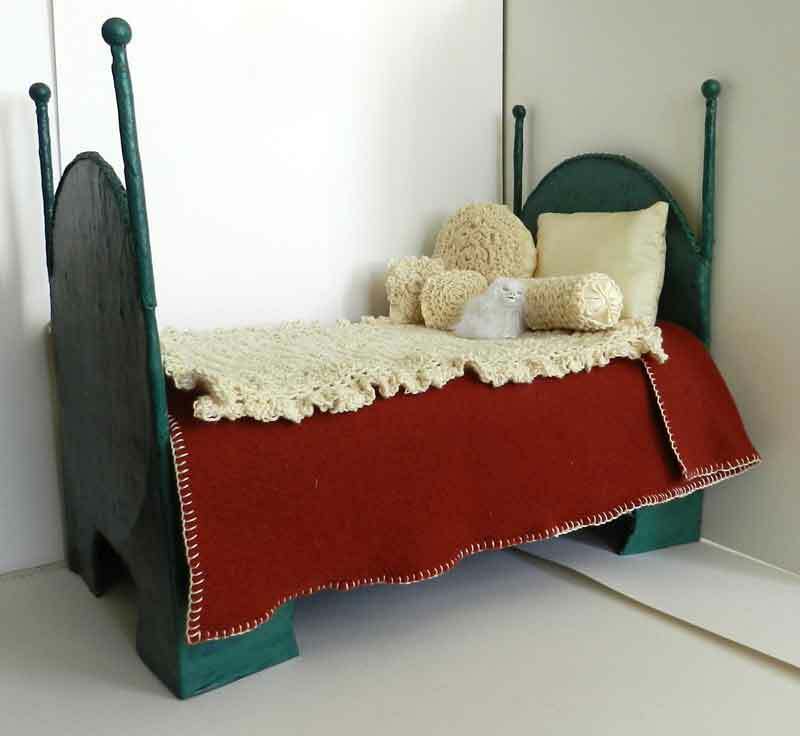 I’m enjoying making them very much, and look forward to creating little wardrobes and environments for them; rooms and dressing room/cases….with lots of accessories! 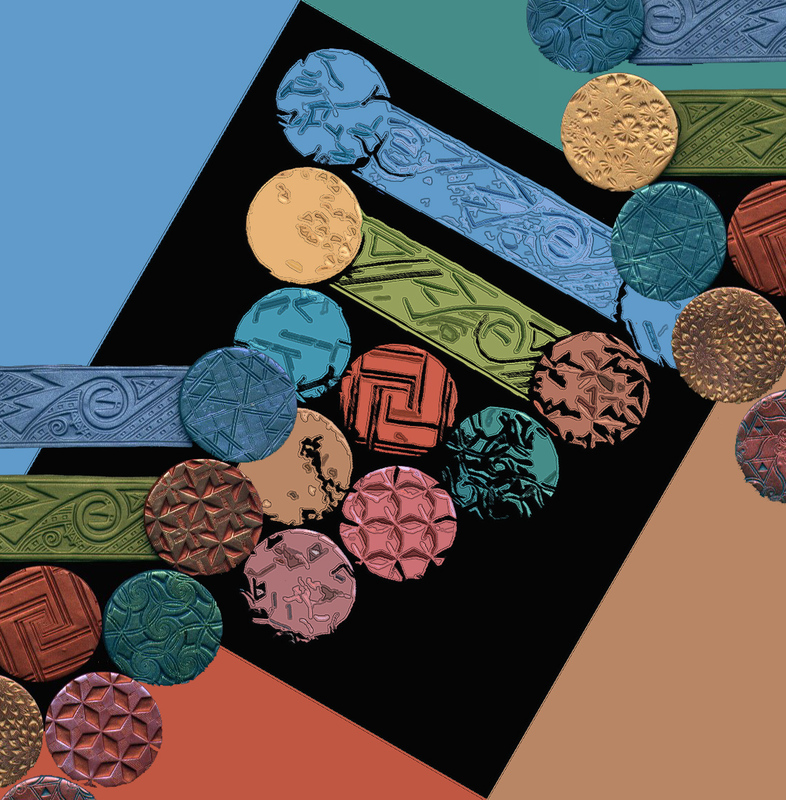 Click here to visit Polymer Clay Adventure where you can have fun with creative projects by 22 great polymer clay instructors–including me. 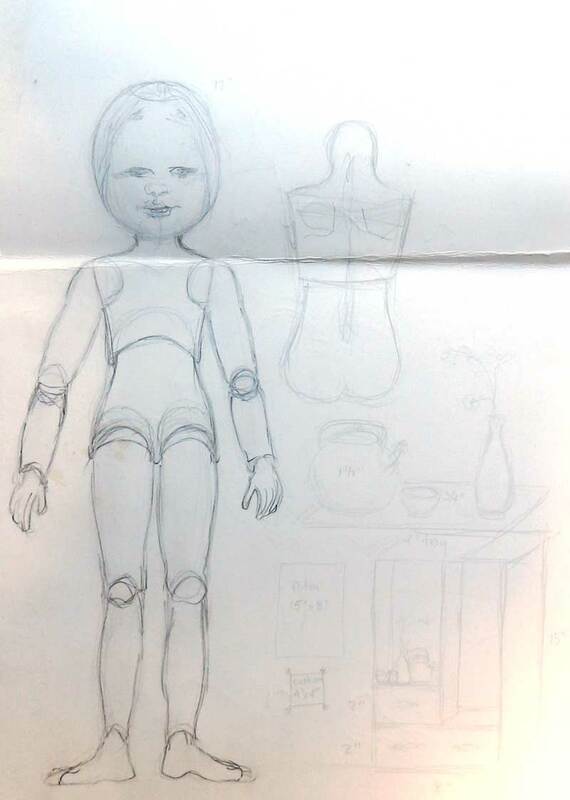 Here is a peek at the opening sequence and a list of what is needed to make a ball joint doll with polymer clay along with me! 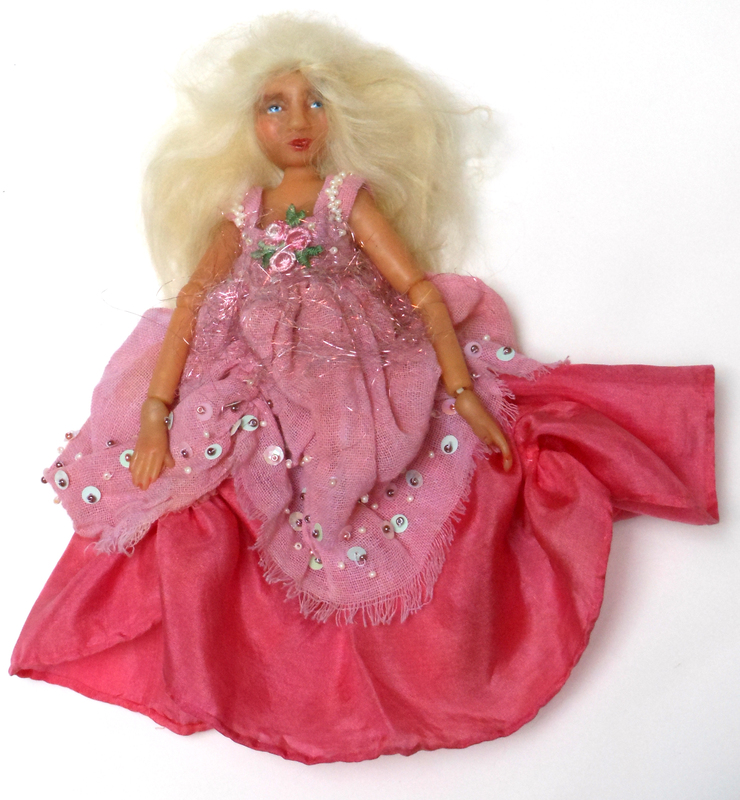 I’m starting a new site, just for dolls and miniatures. I’ll be adding written and video tutorials, lots of info and links, and pictures of projects as they progress. 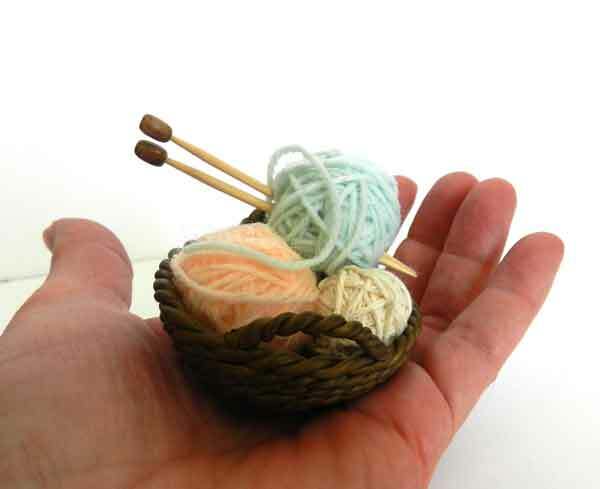 Please do sign up for my mailing list to hear about upcoming classes and events.